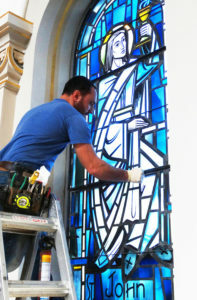 While the Window Creations crew is at work in the chapel, Mass and benediction at St. Charles have been moved to the Gaspar Room. On Sunday, we heard in St. Paul’s letter to the Corinthians that the body has many parts, and all parts are honorable and valuable. May God bless the craftspeople who use their skills and talents to maintain and preserve our places of worship, usually working behind the scenes and in adverse conditions. St. Joseph, patron saint of carpenters and craftspeople, pray for them!